I just want to take this moment at the start of the new year to show a bit of appreciation for a pastor I enjoy from afar. Douglas Wilson is the notably pithy pastor of Christ Church of Moscow, Idaho and is a senior fellow at New Saint Andrews College, a classical Christian college which he helped found and which has been turning heads in academic circles for some time now. 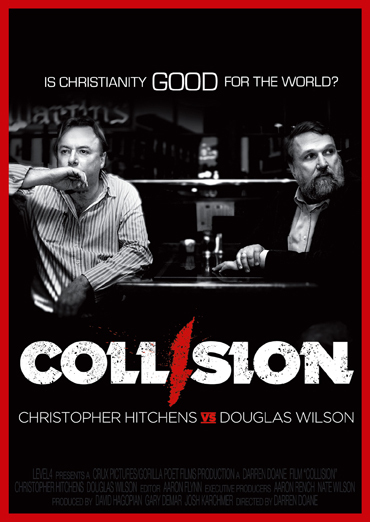 I watched the movie COLLISION today, which documents the journey of Wilson and renowned “anti-theist” Christopher Hitchens as they travel to several stops/debates on the book tour promoting their collaborative book Is Christianity Good for the World? and their exchanges on- and off-stage. A well-made film, it showed the strengths of both of these men in wit and intelligence. Douglas Wilson is a refreshing change from the usual Christians I have seen go up against atheists in debates. He is thoroughly intelligent, confident, and ready to engage Hitchens on multiple levels. Hitchens himself remarks how much he appreciates Wilson and notes how much he differs from the other theists he has debated. I highly recommend the movie as a primer for how a theist/atheistic exchange can be handled. Now, I do not always agree with Douglas Wilson. We have our differences in theology, but none that detract from my opinion that he is one of the best Christian thinkers in the Church today. These differences include the fact that Wilson is of the Reformed denomination and is, thus, a paedobaptist. He actually takes his paedobaptistic covenant theology to (arguably) its logical end, being a proponent of Federal Vision theology (being covenantalist myself, but credobaptist, I find the trail that leads the traditional covenantalists to paedobaptism problematic for this very reason). He is a postmillennial partial-preterist (of course, being an amillennial partial-preterist myself, the difference is minimal, though notable in the right context). So, yes, there are theological differences that come between us, but this does not decrease my respect for the man in the slightest. I recommend reading Wilson’s blog, wittily titled “Blog and Mablog,” whenever you get the chance (a fair warning: Wilson’s blog posts are not concise). Also, he is quite interesting to follow on Twitter. We need more intelligent Christians in the public eye like this pastor and scholar.